Do you want to get in shape, but don’t have the budget for it? You’re not alone – not everyone can afford gym memberships or private trainers. But if your bank account is what’s holding you back from working on your fitness, consider this: Almost 3 in 4 men in the US are considered to be overweight or have obesity. Being overweight and obese make you prone to a large number of health problems, including type 2 diabetes, high blood pressure, and joint problems. So, what can you do? The good news is that exercise doesn’t only happen in expensive gyms. There are many ways to exercise without breaking the bank. You can incorporate exercise into your day from the minute you wake up to the minute you go to bed. For example, when you wake up in the morning, you can do back, and leg stretches while still laying down in bed. (A good back stretch to start the day is to pull your both legs into your chest, then slowly swing both knees over to one side, then the other.) Do a set of squats whenever you’re bending down to pick something up, and then another set when you’re setting it back down. When you carry heavy items like detergent bottles, water jugs, or even a bag of garbage, use them as weights to work on your biceps, triceps, and shoulders. Be creative with this! You’ll be surprised how much exercise you can fit into your day without changing up your daily routine. Chairs, elevators, and cars are examples of amazing inventions that were intended to make our lives easier and more comfortable. However, overuse of these items can be a threat to our physical health. Many of us spend hours of our day sitting, whether at work, in the car, or in front of the TV. Sitting has been linked to increased blood pressure, high blood sugar, and heart disease. So instead of driving to the store or to work, walk or bike there. If you must drive, park your car at the far end of the parking lot and walk. 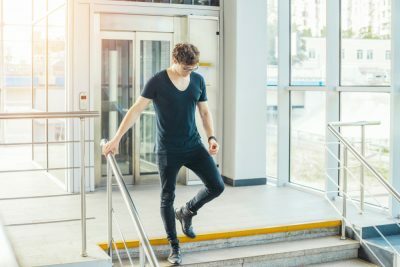 Instead of taking the elevator, try taking the stairs instead. Stand up and stretch every 30 minutes when you’re sitting at a desk. Even while sitting, you can stretch one leg straight out in front of you and do leg lifts while focusing on your core. It doesn’t cost a thing to pull on a pair of old sneakers, open the door, and simply run. Find a local park to jog in or map out a route in your neighborhood that takes you through some interesting views. To motivate yourself, end your run at a destination that you enjoy going to, such as your favorite coffee spot. Hiking is also a great exercise, as it provides an experience that is quite different from the paved roads that most of us walk on. This can be an activity that you can do by yourself in peace and solitude or bring along some family and friends and use it as an opportunity to catch up. To find places to hike, search online for local hiking trails. If you’re new to hiking, start with the shorter trails and those marked for beginners and work your way up. Hiking is great for your mind and body and is a free workout courtesy of Mother Nature. You don’t need to buy a treadmill or a set of weights to create your own home gym. You can invest in low-cost exercise equipment that can last years. For example, an exercise ball can be purchased for as little as $20 and use it for a multitude of exercises. Exercise balls also double as chairs that work your core. Sit on this while at your desk or while watching TV, and you’ll be working out without even knowing it. Resistance bands can be purchased for less than $5 and can be used for both arm and leg workouts. Even if you have absolutely no money to buy these items, don’t sweat it. One of the best ways to exercise is using your own body weight. 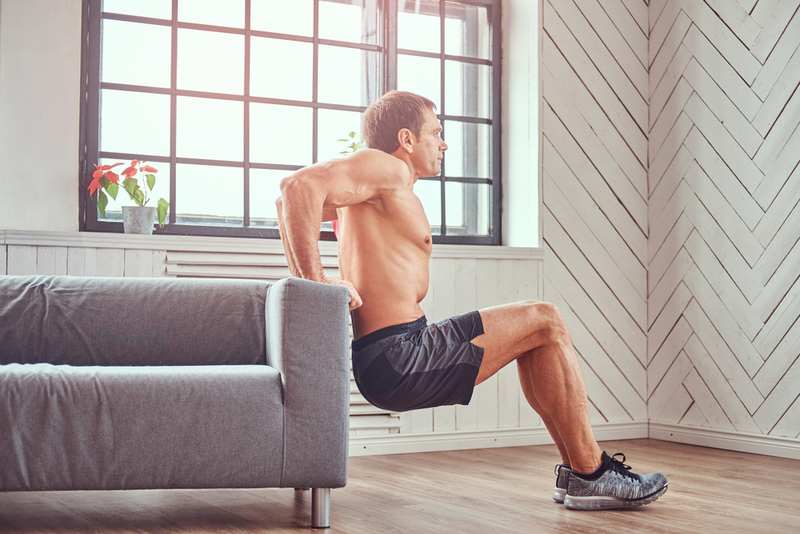 Push-ups, crunches, squats, lunges and tricep dips are just a few of the exercises you can do anywhere, anytime. One of the main benefits of having a personal trainer is that they help create a workout plan and help keep you on track. Luckily, there are free or low-cost resources that you can use that do virtually the same thing. You can search YouTube for yoga videos, workout routines and even exercises that target a specific part of the body. If you prefer to exercise on-the-go, there are a number of apps available on both Android and Apple mobile devices that provide timed workout plans. Some of these apps also allow you to track your progress. These mobile apps can be used even when you’re traveling, so there are no excuses! No matter which of the above you choose to do, you will be more effective if you create goals and a schedule for yourself. For example, set a daily step goal for walking or a distance goal for running. You can easily track these stats using your mobile phone or a fitness tracker band. Mark your calendar with days/times that you plan to exercise, rather than just hoping it will happen. And to ensure that you stick to your goals and are continuing to make progress, it may help to find an accountability partner. This can be a friend or family member who will either do these workouts alongside you or who can commit to checking in with you once in a while to see how you’re progressing. So, keep your money in your wallet and start working out today with these low-cost exercise tips!